C-3PO and R2-D2 are waiting for you. Fascinating artwork inspired by The Empire Strikes Back. Hand-numbered limited edition of only 195 pieces! Recognize these two fine characters? 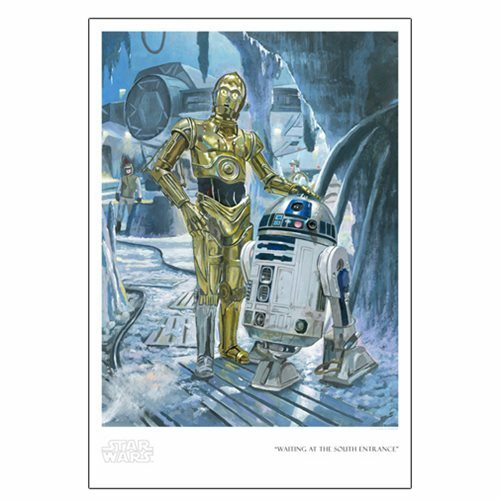 C-3PO and his buddy R2-D2 are front and center in this fascinating Star Wars Waiting at the South Entrance by Bryan Snuffer Paper Giclee Art Print. Waiting at the South Entrance by Bryan Snuffer features artwork inspired by The Empire Strikes Back. An unframed limited edition of only 195 hand-numbered pieces, it measures 19-inches tall x 13-inches wide (image size 16-inches x 12-inches). Each paper print comes with a certificate of authenticity.